I work in the same field as Enclosures International from Dallas, TX. Working with both large and small business's to resolve varied logistical situations all across the US. I call on the services of Enclosures for assistance in Northern California. They are professional as any group I utilize. Their crating, receiving and installation services are dependable and fair. It is a good feeling to know they taking excellent care of my customers. I've done business with Enclosures for 15+ years. I am writing today, to say how much I appreciate the excellent Job you did of packing the items I purchased from a recent Butterfield & Butterfield auction. Each of the four pieces was Wrapped with care and then packed professionally into two boxes so that no damage could be done by the shipper. Some days, I feel as if I will never again see the attention to detail that I once took for granted in the companies I dealt with. Then, along comes a company like yours to give me renewed hope. Thanks for caring enough to be so good at what you do. I went to San Francisco in April to visit my sister. While visiting she took me furniture shopping. I Found this cabinet at a time when I could not even think of owning something as fine as this but I told them if the price ever when down to give me a call here in Washington State. Several months later the store called me and gave me a price I couldn't refuse. i WAS told at that time that I would have to arrange to have it packed and transported on me own. As I had no way of knowing any companies who do this service, your company was picked at random. As I understand from all of my worried phone calls to Vince, the cabinet was a challenge to you. You really surpassed my expectations. When the cabinet arrived there wasn't a ding or nick anyplace. the cabinet is still in the original packing boxed because we are remodeling my home and I don't want anything to happen to it while are hammering and pounding all over the place. Even the delivery people from Bekins told me that the cabinet had been prepared for shipment by people who knew what they were doing. This cabinet has been a fulfillment of a dream of mine to own a truly magnificent piece of furniture. I was able to purchase and have it delivered without selling my soul to the devil. Thanks you again for a wonderful packing job. You made this lady extremely happy. We are delighted to be able to recommend the very fine firm of Enclosures, Inc. to anyone within the antique, fine arts or interior design business who has a need to pack, crate and ship any items of fine arts and valuable decorative accessories. We have a substantial business in Jackson Square in San Francisco dealing in fine 17th, 18th and 19th Century furniture and high-quality accessories, and we have dealt with Enclosures since they started in business eleven years ago. During that time, an enormously high proportion of our business has developed with out-of-state clients. We ship to virtually every state in the Union as well as Canada, England, Australia and the Far East. 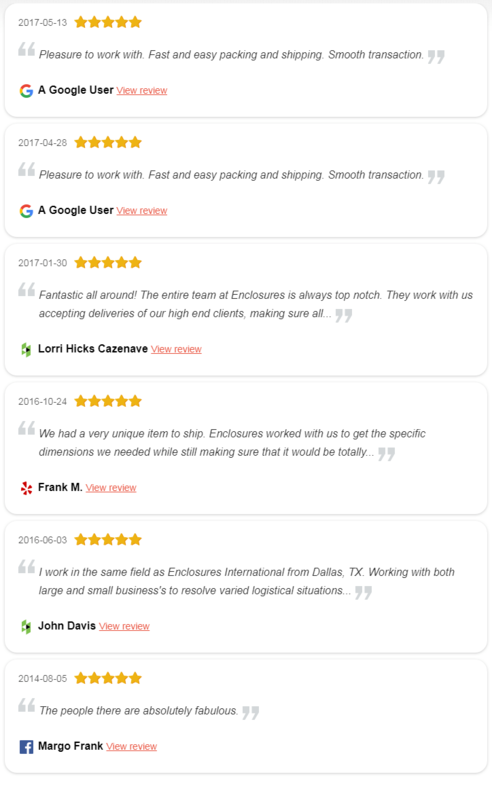 Enclosures has handled all of our out-of-state shipping, and we have nothing but praise for them in their care and concern with all the items they have been required to handle for us. When you use this fine company, you will be giving your merchandise to an extremely well run and efficient organization. I am writing at the request of Enclosures International Corporation, as I understand you are currently considering using their services in your showroom. We have been doing business with Enclosures for several years and have found their service to be both reliable and convenient. They provide prompt estimates, with a breakdown of charges for various methods of transportation, which enables our clients to select the most economical means of shipping their purchases. As you know, we have high value items which are old and often rather fragile; therefore we appreciate the attention Enclosures gives to careful handling and expert packing. we have found the staff at Enclosures to be attentive to our needs and courteous, whether office staff or furniture movers.